Commemorative bricks for Reston’s annual Founder’s Day are being sold through Wednesday, February 14. Bricks will be installed on Lake Anne Plaza after Founder’s Day on April 14. 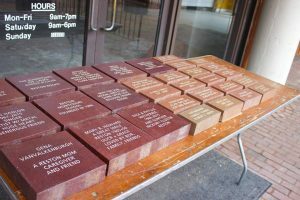 They can be purchased from the Reston Historic Trust and Museum for a tax-deductible contribution of $100 for a standard brick and $250 for a large brick. The tradition aims to bring Robert E. Simon and his vision for a special and inclusive community to life, according to organizers. “It is a way for members of the community to leave a legacy or honor a loved one. The bricks are also a tangible and visible way for the community to be a part of the history or Reston,” said Alexandra Campbell, executive director of Reston Historic Trust and Museum. Founder’s Day is presented by Reston Historic Trust and Museum, Reston Association, Reston Community Center, and Public Art Reston. The event is hosted by Lake Anne Plaza.